Most Chinese are very superstitious, I know we are a weird bunch, many of the things we do and eat around CNY can all relate to some meanings, mostly something to bring auspicious lucks. Any thing bad is usually avoided or not permitted like no sweeping around the house during the first few days of CNY, this will sweep away any lucks!. Bad luck food is stir fried squid 炒魷 because another meaning for (chow yau 炒魷) is being fired or lost your job, a very bad karma for these days. Yesterday (Saturday) was the 7th day of CNY, referred to as everyone's birthday, see this post. This was another important day to celebrate with auspicious food. Normally I have raw fish salad or Yu Sang but I could not find any good quality tuna and don't fancy salmon. So opt for other food common for this day. Because it is the 7th day, it is lucky to eat either 7 different auspicious dishes or made a dish with 7 vegetables. With these 7 different vegetables every one selected usually means something to bring us luck or prosperities. These seven vegetables can either use to make a rice soup or congee 七菜粥, seven vegetables soup 七菜羹 or use all in one single stir fry dish. Different people may use different vegetables, all up to you if you are superstitious enough to link each vegetable to some meaning. Lettuce (sung choi 生菜), this symbolises growing wealth (sounds the same in Cantonese as sung choi 生財). Another meaning is very lively (in Cantonese is sung sung mang mang 生生猛猛). I used iceburg, any other lettuces is acceptable too. Leek (da suan 大蒜), symbolises someone is clever with money (in Mandarin is hui suan chen 會算錢). I could not find Chinese leek so used English leek. Carrot or mooli 蘿蔔, these two vegetables are normally called chai tao 菜頭 in Teochew which sounds simliar to (how chai tao 好彩頭) meaning bringing good luck. I used carrot. Phew!!! These superstitions are giving me a headache. So if any of you is Chinese and your mum or granny cook with these vegetables on this day you know why. 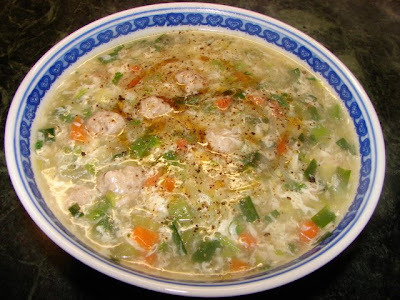 Here is what I did to these vegetables to make a thickened soup 七菜羹. Cut, chop or dice these vegetables into small pieces as picture shown below. Also prepared some tiny meat balls (around 125g) using marinated pork mince (ground pork) with some soy, sesame oil, ground pepper and cornflour. With all these also some beaten eggs, 2 for this case. Boil about 1 litre of chicken stock (can also use pork or vegetable stock) till hot, then add celery and carrot. 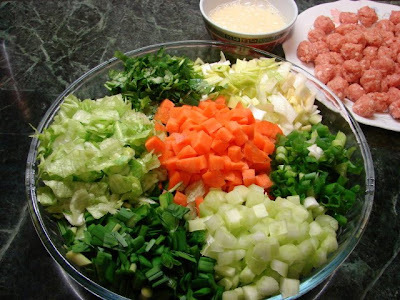 Simmer till vegetables are tender then add meat balls, Chinese chives, lettuce and leek. Simmer till tender. Then seasoned soup with a bit of light soy, pinch of salt and ground pepper. This is followed by thickening the soup with cornflour 2 - 3 tbsp slackened with some water, thickness to your liking. Bring the liquid to rapid boil, then drizzle and stir beaten egg into the soup to form egg ribbons and stir in coriander and spring onion. Heat off and drizzle with some sesame oil. Here is the result. Very tasty too and quite simple to make. I also had soup noodles yesterday. Noodles are lucky for any birthday, to symbolise long life. Will post the recipe later. Happy Late Birthday to ALL! It's fascinating to read the CNY feast series. Happy Belated birthday to you too. Are there any weird and wonderful superstitions related to Paskitani/Afghan food you know. Maybe you can write a post about this.